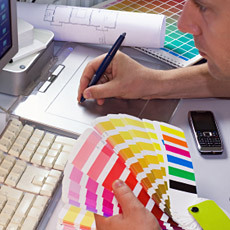 Graphic design is the beginning of a complete production cycle. All our visual decisions are approved by the end user and are processed by our specialists in the pre-press stage up to the point where the product is ready for printing. We work with the best products for prepress and electronic assembly, such as: Adobe Indesign, Adobe Illustrator, Corel Draw, KODAK Preps. Since 2006, we launched into service Web based server "KODAK Insite" - a system for On-line submission and approval of files for printing. This improves the speed, reduces costs and creates confidence in submission of the correct information for printing by the customer. To ensure high quality and worldwide printing consistency, we use a digital colour proofing system "KODAK Matchprint Proofer", which simulates the printing process within the permissible tolerance for color table "FOGRA 39L" /colour reproduction in offset printing/. Another investment that has been made in modern technology is the machine for printing on thermal plates - CTP "Creo Trendsetter Quantum 800 II". We use it to eliminate obsolete technology - the exposure of films on plates and to avoid the numerous defects arising from the manual assembly.